Impress your guests with a beautiful watermelon centerpiece, the perfect way to serve fresh fruit salad at your party, picnic or special occasion. If you've always wanted to learn how to make a watermelon basket, we include step-by-steps for two watermelon basket designs. These fun DIY edible crafts are a super summer activity. With our easy guide, you can make watermelon fruit baskets to dress up any event! 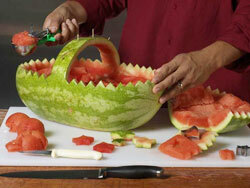 Step-by-step instructions on how to make an American Watermelon Basket and a Watermelon Swimming Pool are below. Watermelon fruit baskets make a feabulous centerpiece if you're hosting a party, but they're also fun and decorative as a bring-along, too! This American Watermelon Basket is just the thing for your patriotic picnic, Fourth of July bash, or Labor Day party but, like watermelon, it works as a festive watermelon centerpiece year-round. Using an oblong watermelon, slice 1/4 inch off the bottom lengthwise to provide a stable base. Use a pencil to draw lines for handle placement and basket opening. Cut the handle first, wide enough to hold stars, then make zigzag cuts with a paring knife all the way through the rind (be careful not to cut through handle base on either side). Carefully remove sections, pull out large chunks of flesh, and cut them into 3-inch squares. From squares, trim off 3/4-inch-thick slices to use for cutting out stars. To cut stars, use 1-1/2-inch to 3-inch star-shaped cookie cutters. Next, cut out 5 large star-shaped pieces from the leftover rind (use a paring knife, if necessary) for the handle. Trim off red flesh and, using toothpick halves, attach to basket handle with white side out. Use an ice cream scoop to remove flesh from inside of basket and cut scoops into quarters for the fruit salad. Place in bottom of basket. Use a white-fleshed melon, such as ripe honeydew, to cut out white "stripes" for salad. 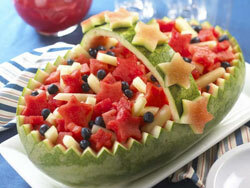 Garnish top of fruit salad with watermelon stars, melon stripes, and blueberries. Your summer party will be the hit of the season when your guests "dive into" this incredible-looking watermelon fruit basket! With all the goodness of healthy fruit and the eye-catching appeal, you'll make a big splash with this watermelon centerpiece! Cut a 1/4-inch slice off the bottom of the watermelon to provide a stable base. Draw lines in a wave design, with a sharp pencil or thin marker, approximately halfway up and all the way around the watermelon. Cut the watermelon along those lines. Scoop out the flesh with an ice cream scoop or large spoon, and reserve for fruit salad. 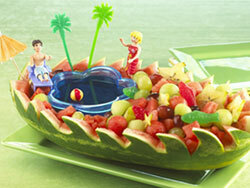 Create a water scene by placing the blue gelatin container in the watermelon bowl. Fill in around the "water" with fruit salad cut into fun shapes and balls. Arrange small, clean, non-toxic, new, small beach-themed toys and plastic dolls toward the edge of the watermelon bowl to create a beach scene. Garnish the sides with drink umbrellas and plastic palm tree swizzle sticks, and add gummy fish to the top of the salad and gelatin to complete the scene. What a GREAT idea & can be used not only for children. There are lot's of different cookie cutter pieces which can be used. Can't wait to try! Thanks for the GREAT idea! !